Arwyn the cheeky Welsh Leek! Handsewn with green and white felt. Dimensions: 150 mm tall 50 mm wide. Not suitable for young children – handmade felt toy. This is Arwyn a cheeky Welsh Leek! Arwyn likes to point out that his name means ‘handsome’ and that he’s very important being the National Emblem of the Welsh. He poo poos on suggestion that the Daffodil is better! Look at his wonderful green leafs! So much more impressive than a stalk! Admire his gleaning white body! Who could prefer the colour yellow? It’s like a egg yolk! See his distinguished grey roots! Yes, a Leek is so much better! Arwyn is very sociable and likes to get out and about. He is looking for a fun home, someone who likes watching a bit of rugby, and enjoys holidays in Wales. 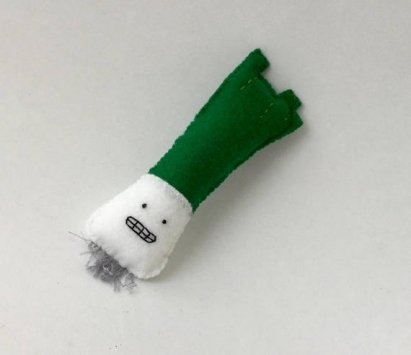 This Leek is handsewn with green and white felt. He has a cheeky grin and grey roots.